Enjoy our unit located on the eighth floor at Sterling Shores. One of Destin's finest luxury resorts with a stunning view of the gulf. 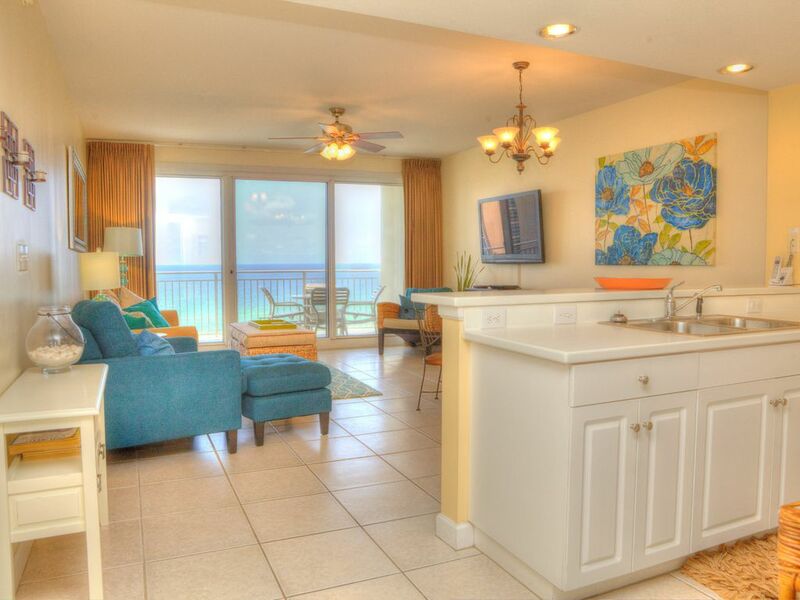 This non-smoking, beautifully decorated, two-bedroom, and two-bath condominium home has the best views overlooking the beach, pool, and you can see the Destin skyline. This unit has extended tile in the living/dining area and Corian countertops in the kitchen. Beachside with dedicated beach, beach pool, beach club, and beach service. The condo was immaculate and had everything we needed (beach chairs, beach towels, etc). The view was INCREDIBLE! We saw dolphins almost every morning and at dusk. The two pools and beach were fantastic. Highly recommend! Beautiful view of gulf and grounds. Living room furniture not very comfortable. Overall we enjoyed the unit and our stay in Destin. The apartment was fantastic and the view is awesome. This property is perfect. There were two of us and more than enough room. The view from the kitchen is just like in the picture. The staff was extremely helpful, the experience could not have been better and the apartment could not have been nicer. We had a wonderful time! The place was perfect, had perfect views just standing in the kitchen! Beach toys, boogie boards, beach chairs, and beach towels were even included, which was very helpful as we flew to Florida and couldn't bring a lot of supplies. It was very homey and comfortable and the walk to the beach was so short and easy! Will definitely go back! This was the perfect place for us. It was beautiful. The view was amazing! Overall was nice.. A few things that need attention. And not a fan of the beach policies in regards to chairs & umbrellas.